Modern updates of an old favorite! You’ll fall in love with these modern versions of the string quilt! Combine strips with negative space and be ready for a surprise or two! Your granny wouldn’t recognize these new versions of the classic string quilts! Modern and contemporary or wild and funky! Choose the size and color of your background; add strings in all solids, prints, or a combination. Use a limited palette or go wild with scraps. 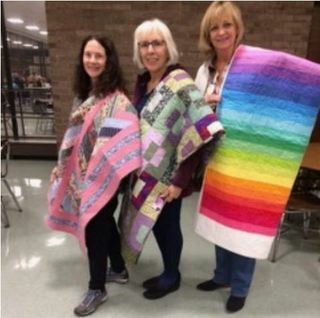 No two blocks or quilts alike! Holiday Boutique – Come early (6pm) to buy some special treats for the holidays! The Boutique will be located near the Guild library table outside the auditorium. -Some of the offerings include vintage buttons, vintage handkerchiefs, textiles, quilting books and jeans bags. – Comfort Quilts will have a fantastic selection of Fat Quarters at an unbeatable price, 2 for $1, as well as XMAS FQ’s and donated notions. Remember to bring your checkbook so that you can sign up for the Lancaster Trip which is on March 29th and 30th. Super Saturday is on February 16th. More details on both of these events will be presented at the meeting. Keep working on your special anniversary Ruby Challenge due at the February meeting. Winter Programs – Keep looking for those Ugly Fabrics, and when handing them in, please have them folded and tagged with yardage | size. We are looking for volunteers to teach at various tables for the “Tips and Techniques” demo meeting in February. Please contact me if you would like to share an interesting or time saving idea that works for you. I am also hoping to have a new table geared towards young adults that is “Quilting for Beginners” to get a new generation involved. 2) Please contribute to the annual Food Drive as you come into the meeting by bringing non-perishable foods, gifts cards, or monetary contributions. 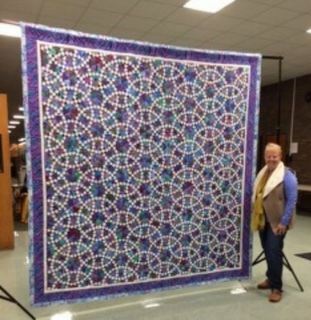 Raffle Tickets – Tickets for the 2019 grand prize quilt, Jack’s Chain, will be available at the November Guild Meeting. Please pick up your Raffle Ticket Packet and support this year’s nominated charity La Dulce Esperanza, a summer camp for the children of migrant workers. Please send in your registration form and check for $45 before the November Guild meeting so we can start putting the Members Directory together and hopefully have it printed ready for distribution at our December Guild meeting. The Guild Library will be open at the November meeting from 5:45 to 6:45pm.